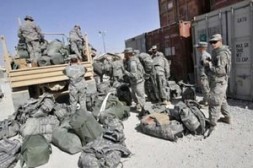 Newly-arrived troops of the US Army load their bags onto a truck at Kandahar military base on October 3. Eight foreign soldiers killed in a firefight in eastern Afghanistan were American, NATO's International Security Assistance Force (ISAF) said Sunday. WASHINGTON - A battle that killed eight Americans at a pair of remote military bases in Afghanistan last weekend also left more than 100 insurgents dead, NATO said in a statement released on Tuesday. The statement said that insurgent forces suffered "significantly higher losses than originally thought," but it provided no details of how NATO had reached that number. A senior NATO spokesman in Afghanistan, Rear Adm. Gregory J. Smith, said in a subsequent e-mail message that NATO had based its calculation on interviews in the area after the attack, intelligence sources and aerial surveillance. The NATO statement said that the attack was conducted by "local anti-Afghan forces," as originally thought, but that local Taliban and insurgents connected to the militant network of Gulbuddin Hekmatyar might have helped in the assault. The attack, a daylight strike on two bases near the border of Afghanistan and Pakistan, also killed four Afghan security officers. It was the deadliest attack on American soldiers in more than a year and occurred less than 20 miles from the site of a similar attack last year that killed nine Americans. The debate over the Afghan war has sharpened within the Obama administration, including the extent of the Taliban threat. On Sunday, the day after the attack in Afghanistan, President Obama's national security adviser, Gen. James L. Jones, said on CNN that he did not believe that Afghanistan was in "imminent danger of falling" to the Taliban. The weekend battle began when insurgents stormed two American base camps in the Kamdesh District of Nuristan Province with guns and rocket-propelled grenades. A provincial police chief estimated that about 300 militants had taken part. Col. Wayne M. Shanks, another NATO spokesman, said over the weekend that the Americans had fought back with helicopters, heavy guns and airstrikes, a counterpunch that may account for why the insurgents suffered such heavy losses. Gen. Stanley A. McChrystal, the senior NATO and American commander in Afghanistan, is pressing for a change in strategy that would move American troops out of remote bases like the ones in Nuristan and into more heavily populated areas to protect civilians. Mr. Obama and his national security team are scheduled to meet on Wednesday and again on Friday to assess that strategy and determine whether to send more forces to Afghanistan. General McChrystal has asked for as many as 40,000 additional troops.